Eric Arthur Blair (25 June 1903 – 21 January 1950), who used the pen name George Orwell, was an English novelist, essayist, journalist and critic. His work is marked by lucid prose, awareness of social injustice, opposition to totalitarianism, and outspoken support of democratic socialism. Orwell wrote literary criticism, poetry, fiction, and polemical journalism. He is perhaps best known for his dystopian novel Nineteen Eighty-Four (published in 1949) and the allegorical novella Animal Farm (1945). His non-fiction works, including The Road to Wigan Pier (1937), documenting his experience of working class life in the north of England, and Homage to Catalonia (1938), an account of his experiences in the Spanish Civil War, are widely acclaimed, as are his essays on politics, literature, language, and culture. In 2008, The Times ranked him second on a list of "The 50 greatest British writers since 1945". 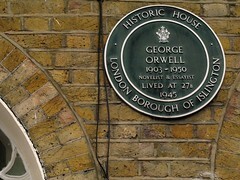 Orwell's work continues to influence popular and political culture, and the term Orwellian—descriptive of totalitarian or authoritarian social practices—has entered the language together with many of his neologisms, including cold war, Big Brother, thought police, Room 101, memory hole, newspeak, doublethink, and thoughtcrime. George Orwell 1903-1950 The writer George Orwell, born Eric Arthur Blair in 1903, received national acclaim for the books he wrote between 1920 and 1950 describing living conditions in Britain and abroad. 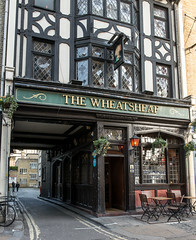 He is known to have stayed nearby in Darlington Street and Warrington Lane in February, 1936, and afterwards published his well known book "The Road To Wigan Pier"
George Orwell Author 1903 - 1950 Drank here !